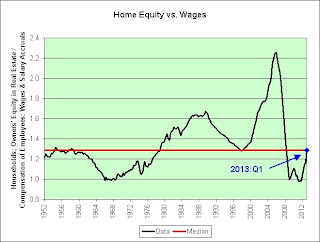 When Will U.S. Home Equity Fully Recover? 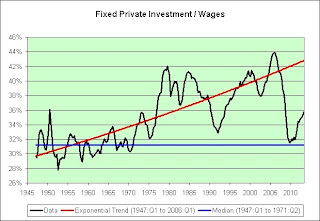 The Fed's Long-Term Plan to Save This Economy! Channel of Despair vs. Triangle of Death! What If Robots Work Full Time? 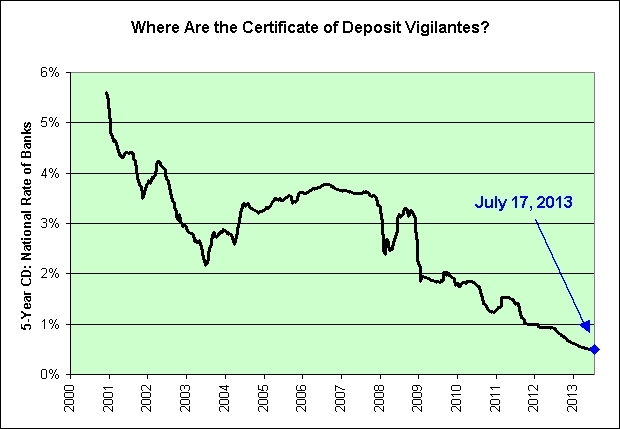 Where Are the Certificate of Deposit Vigilantes? 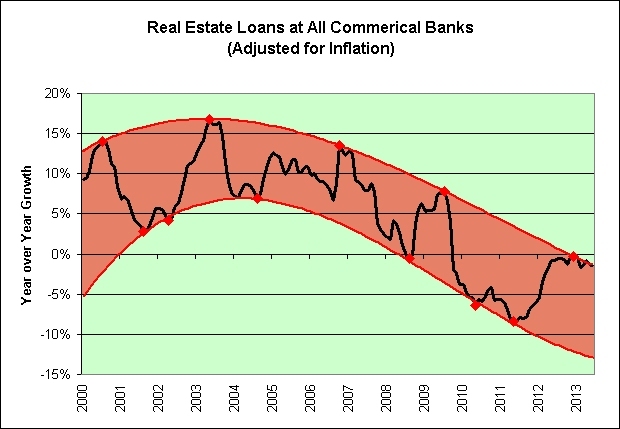 Bank Loans: "It's Getting Personal"
Returning to the gold standard median (in blue) will not be allowed! We must malinvest exponentially again (in red)! Starting in the 1959-1969 administration of President Charles de Gaulle and continuing until 1970, France reduced its dollar reserves, exchanging them for gold at the official exchange rate thereby reducing US economic influence. 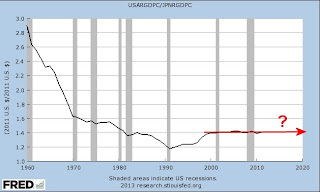 This, along with the fiscal strain of federal expenditures for the Vietnam War and persistent balance of payments deficits, led US President Richard Nixon to end the direct international convertibility of the dollar to gold on August 15, 1971 (the "Nixon Shock"). Malinvestment is a concept developed by the Austrian School of economic thought, that refers to investments of firms being badly allocated due to what they assert to be an artificially low cost of credit and an unsustainable increase in money supply, often blamed on a central bank. The rest of the world takes great delight in the economic data released today. 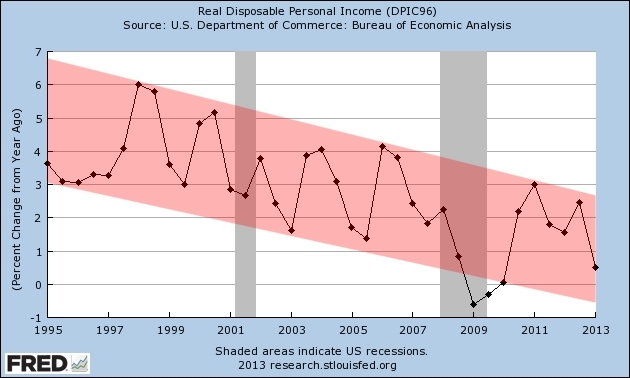 Perhaps few bothered to look at real disposable personal income growth? 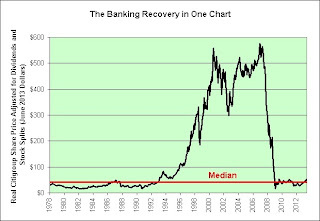 As seen in the chart, the peak was set on July 5, 2013 (the very next trading day after his quote). 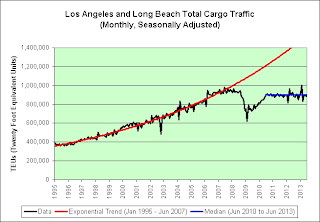 The exponential trend in red failed and a new exponential trend in blue took its place. 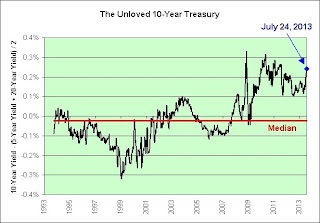 How long the new trend lasts is anyone's guess, but as a long-term believer in death of real yields theories, I'd be more tempted to buy 10-year treasuries than sell them right now. In all seriousness, hindsight clearly shows that "most important" and "impending" were both opinions, not facts. 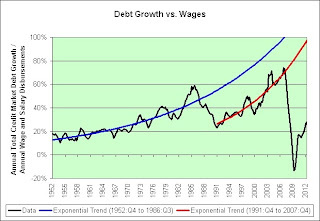 It never fails to amaze me how much the financial "experts" can't seem to tell the difference. 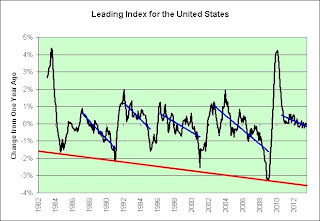 The following chart shows the Leading Index of the United States. 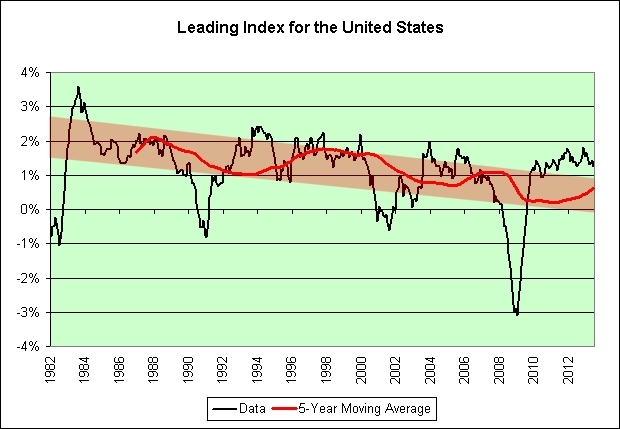 I have added a 5-year moving average in red and a trend channel to go with it. 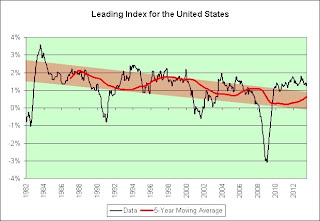 The following chart shows the year over year change in the Leading Index of the United States. 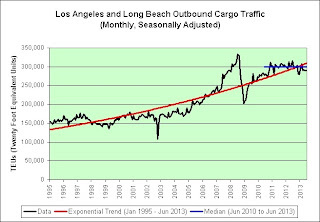 I have added short-term trend lines in blue and an apparent long-term floor in red. 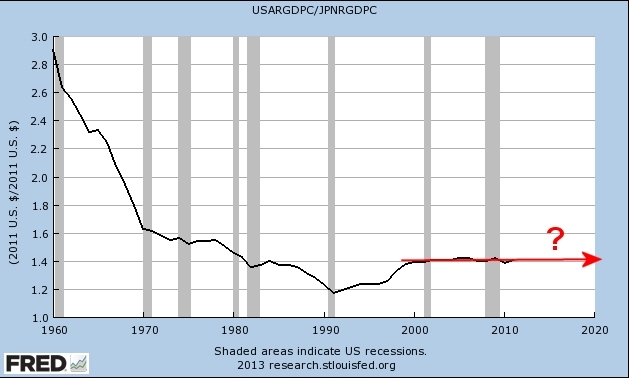 The following chart shows the real GDP per capita in the United States divided by the real GDP per capita in Japan. As seen in the chart, real GDP per capita growth has been extremely synchronized between the two countries since 2000 (a flat horizontal line in the chart means we're growing or shrinking at exactly the same pace). I might even argue that we've finally caught their disease. The 2-year treasury bond in Japan yields 0.11%. The 1-year treasury bond in the U.S. yields 0.11%. 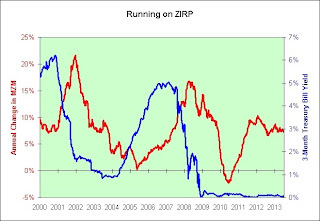 We don't seem to believe yet that ZIRP could be with us for a long time, even though it has already been with us for nearly 5 years. Perhaps investors expect the leading indicators to start ramping back up again at some point? I think they might, but only after the next recession, and even then only temporarily. Just an opinion. Sigh. 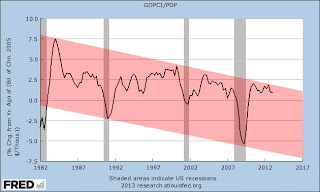 I have taken the liberty of running a red trend line through the blue points in the chart. Doesn't it just fill you with unbridled optimism? 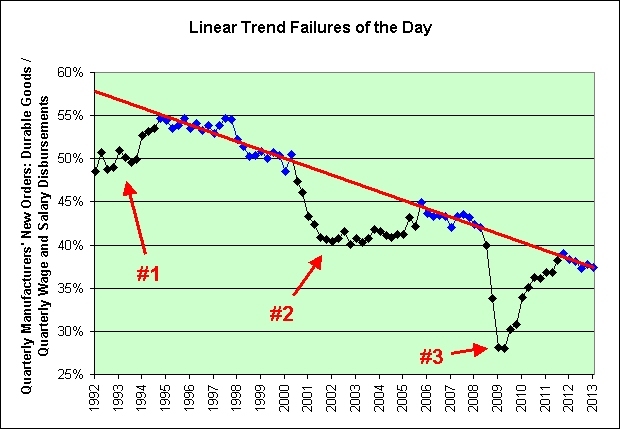 Just because there have been three linear trend failures doesn't mean that there necessarily has to be a fourth. 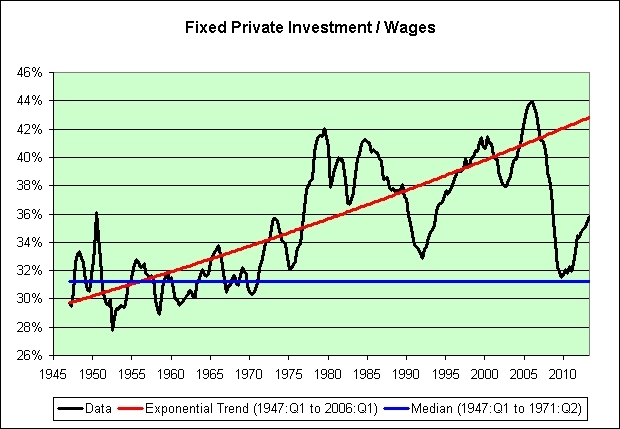 That's especially true now that the Fed has permanently put a stop to recessions. 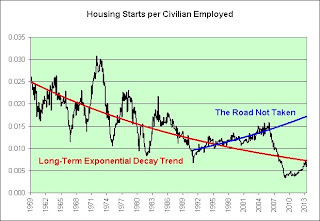 Just because the overall long-term trend is down doesn't mean that it will necessarily continue to go down over the long-term. 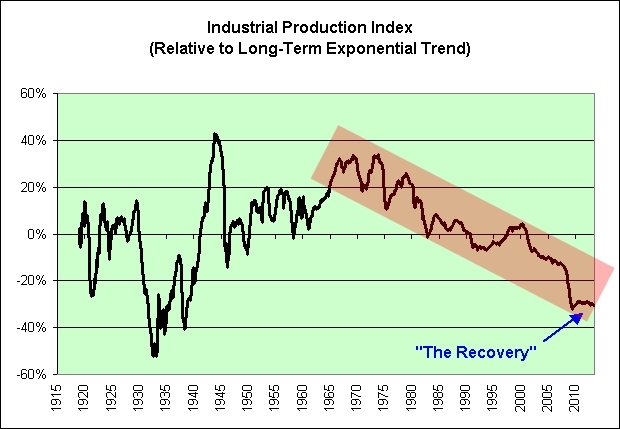 A ZIRP-induced prosperity wave could appear at any moment. All sarcasm aside, I'm not attempting to predict the future here. I'm simply pointing out a very serious risk. 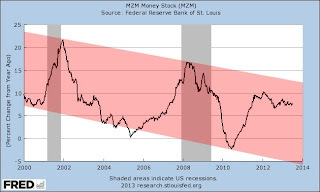 If the downtrend continues, and it fails yet again, especially at a time when few others think a recession is even possible, then watch out below. It could get very ugly. It is definitely not a risk that I am willing to take with my nest egg. That said, what's new? That's 5+ years of fear so far. I can't speak for others, but as a saver I tend to fear the opposite even more. 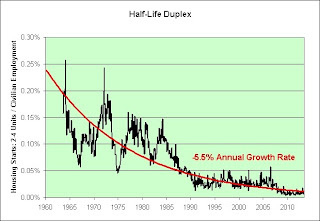 What if ZIRP sticks around a lot longer than most expect? You know, like it has been doing. The first quarter of 2013? 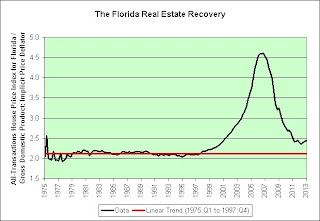 It would seem that the Florida real estate market has nearly fully recovered. 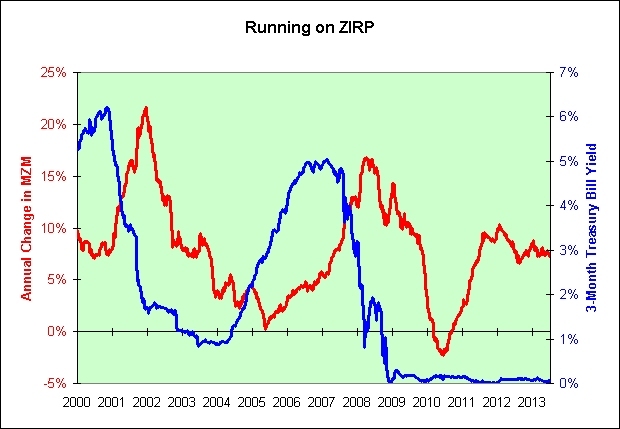 In my opinion, the ZIRP will continue until morale improves. Just look at all that red silly putty! I wonder what will happen if it stops appearing? The following chart shows how much total credit market debt has grown over the previous year compared to annual wage and salary disbursements. Although we did not hit 100% on the previous 2 attempts (as seen in the blue and red exponential trend line failures), I'm feeling really lucky about attempt #3! Baby needs new shoes! 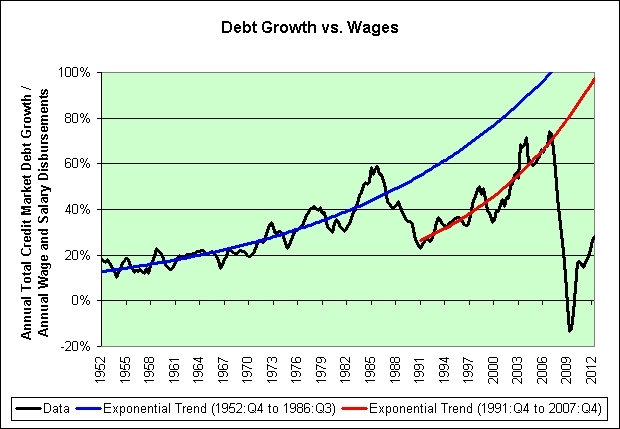 We're already back to collectively borrowing nearly one dollar for every three dollars paid in wages. Just two more dollars to go! Woohoo! Perhaps it would be best to start searching the couches for loose change? I'm only suggesting it on the off chance that the economy can't sustain its historical long-term growth rate without it. I know, crazy talk. What's $27.7 trillion among friends? 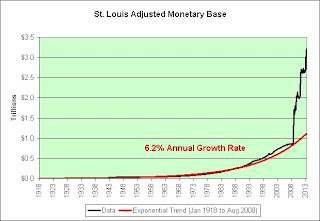 The following chart shows annual GDP per Capita growth adjusted for inflation. 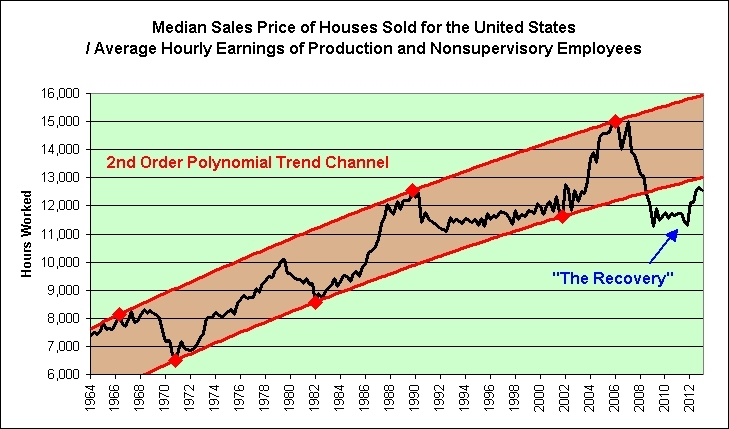 I'd be tempted to answer that we could stay in the long-term trend channel. I mean, that's really bad long-term, right? I'd be wrong to answer with such optimism though. There's clearly something even worse. We could move to the middle of the trend channel again. That would be really bad. 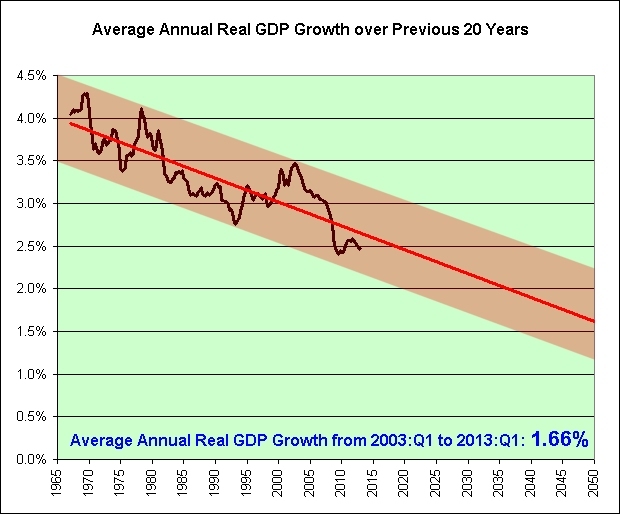 Note that the middle of the trend channel shows roughly -2.5% annual real GDP growth per capita. Ouch. That's still not the worst that could happen though. In theory, we could actually move from the top of the channel all the way back down to the bottom again. I'm not suggesting that the trend channel can accurately predict the future. I'm also not suggesting that we will move to the bottom of the channel even if it is valid going forward. I'm simply saying that the trend channel could be valid and that we could move to the bottom of it. Since 2004, I am a permabear. These are the things that would keep me up at night if I was a stock market investor. 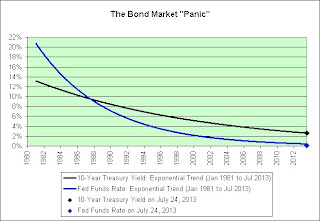 In any event, I think it helps explain why I prefer long-term TIPS and I-Bonds. I'm just not much of a risk taker these days. I value my sleep. 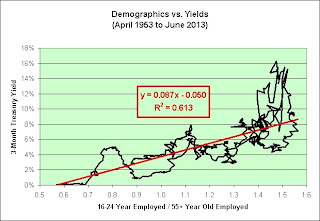 The black line shows the employment level of 16-24 year old workers divided by the employment level of 55+ year old workers (left scale). 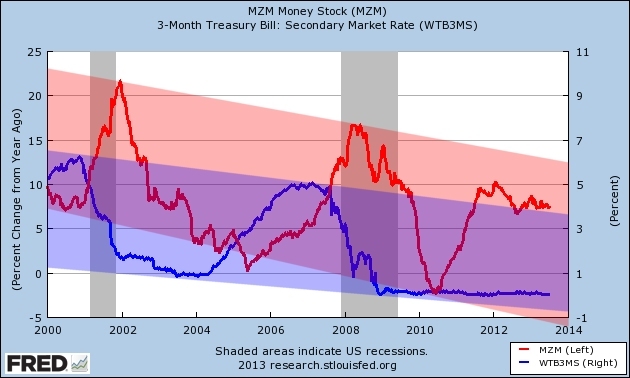 The blue line shows the 3-month treasury yield (right scale). Coincidence? Let's make a scatter chart of that data. That's a fairly high correlation. I bet we can do better though. The data is noisy. Let's smooth it out by using 10-year moving averages and try again. Coincidence? I think not. Let's do another scatter chart. That's a very high correlation. If this chart is any indicator, then those anxiously awaiting a return to the interest rates of the 1970s may be in for an extremely long wait. I noticed a labeling error in my charts. It has been corrected. 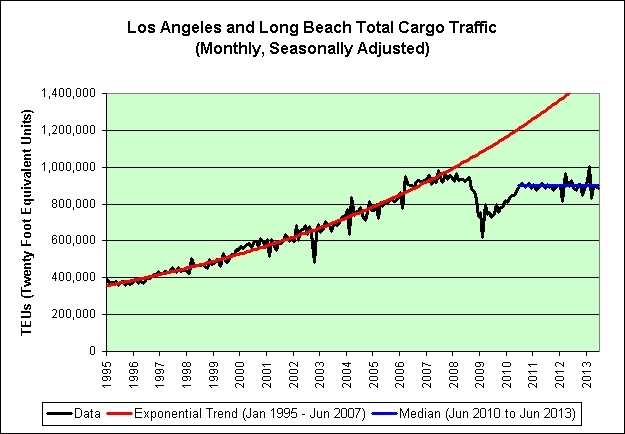 Not all exponential growth trends fail spectacularly with a trend reversal? Some actually accelerate to the upside? Who knew? I don't think I've ever been quite so optimistic about the future! Why weren't we doing this all along? It took us nearly a century to finally figure out the trick to perpetual prosperity? What's wrong with us? WASHINGTON — Americans are more confident about the economy than at any time since July 2007, a survey found, suggesting consumers will spend more and accelerate growth in the months ahead. Yes! That's the spirit! I am not alone in my optimism! 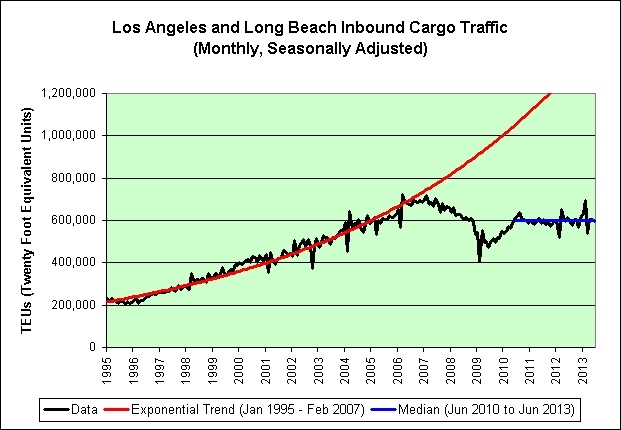 We'll spend more and accelerate growth in the months ahead just like we did in 2007! What could possibly go wrong? The Great Recession began in December of 2007? Seriously? It's a fact? I'm way too frickin' optimistic to listen to the naysayers! Shun the nonbelievers! Three More Years of Goldilocks! We're heading to Candy Mountain! Woohoo! Todd Thomson had originally planned to focus his Forum presentation on the low risk involved in investing in the developing world. But given the sell-off in global stock markets that occurred in the weeks preceding his presentation, Thomson did some quick editing. "Obviously there is risk in these markets," he said. "Yet I am convinced that the recent turbulence is a small bump in the road; it's technical, not fundamental." The events of the last few weeks, he added, signify "a correction, and the only surprise is that the correction took so long. I have been nervous for a year about the lack of risk in these markets, about the exuberance of the equity markets. 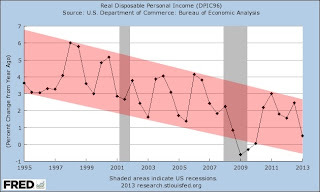 This is clearly unsustainable." That priceless anecdote was brought to us courtesy of Knowledge@Wharton. With knowledge like that, who needs ignorance? But we have heard this tale of terror one time too many. 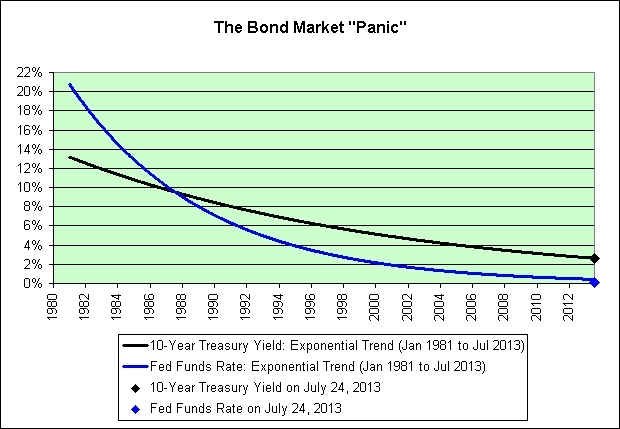 Unlike the first time Whitney tried to scare us about munis, the bond market is not having a panic attack today. Nor should it. 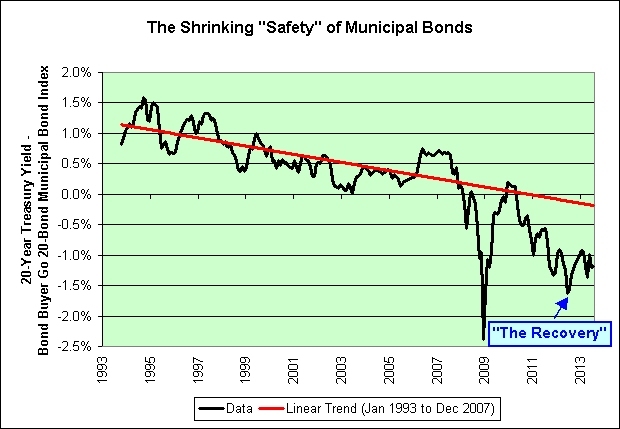 The following chart compares the yield of a municipal bond index (bond buyer index, general obligation, 20 years to maturity, mixed quality) to the yield of the 20-year treasury. 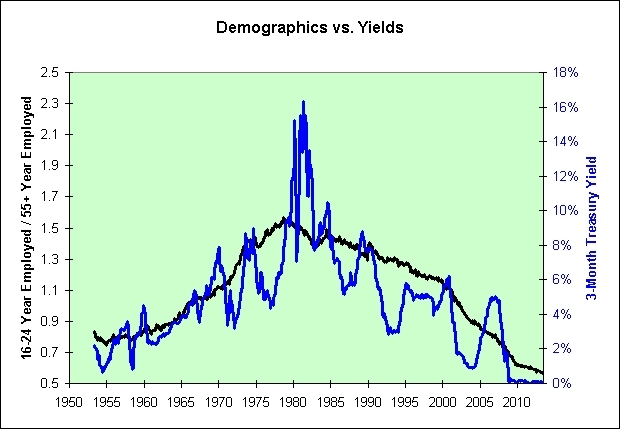 If the long-term trend in this chart continues, then municipal bond yields will rise (and will continue to rise) once treasury yields stop falling. How's that for scary? Want scarier? 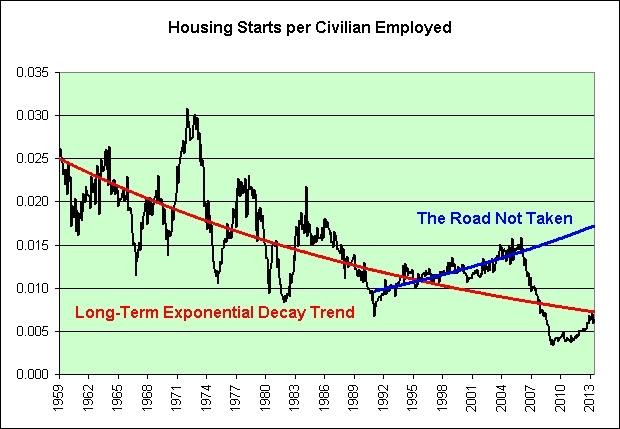 The declining long-term linear trend has actually failed. 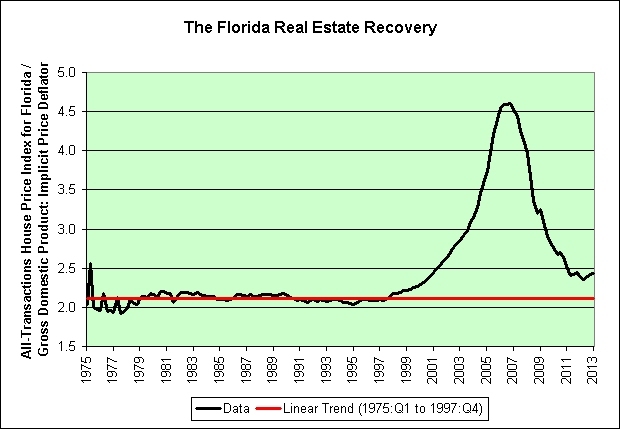 The Great Recession caused it to go from bad to worse. I'm therefore willing to offer an opinion. Yes, Meredith Whitney, over the long-term Detroit's bankruptcy could very well lead to a wave of municipal defaults. 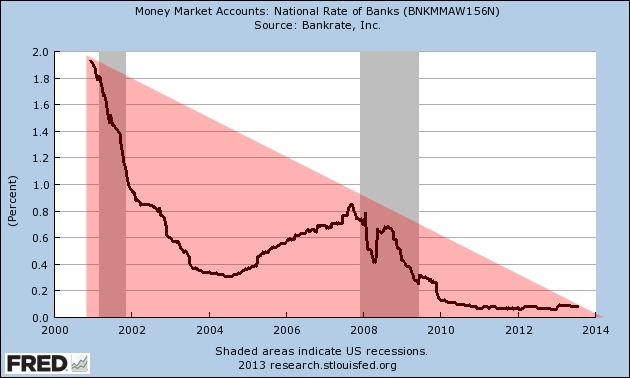 For what it is worth, I'm not a big fan of investing in declining linear trends breaking to the downside. 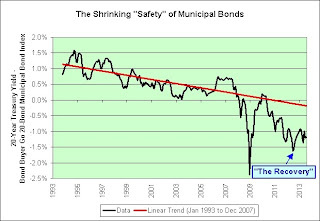 I have had no desire to invest in municipal bonds at any point in my life. I feel no great need to start now. CNBC saw some of its lowest ratings in May since 2005, according to Nielsen. In 2012, CNBC was off 13 percent in its core audience. I'm still glued. I love to see analysts fight over a stock. You know. One says that it will rise by 10% and the other claims it will rise by 20%. That's great info for me. I just average their estimates, assume I'll earn that over the long-term, and then go on spending sprees at my local Sears, J.C. Penney, and Radio Shack. And don't even get me started on how useful Mad Money and Fast Money are to me. I love both of those shows so much that mere words can barely do it justice. Mad? Yes! Fast? Yes! It's the only way to make risk-free money over the long-term now that the economy has been horribly crippled and disfigured. In fact, I use the information I get there to compete with other people also getting their information from there. It's like getting inside information that's actually shared with everyone. Not only that, but this mechanism really levels the playing field between retail traders and institutional traders. I'm watching a TV with some crazed guy pushing sound effect buttons but they only have supercomputers and advanced trading algorithms! What could possibly go wrong? 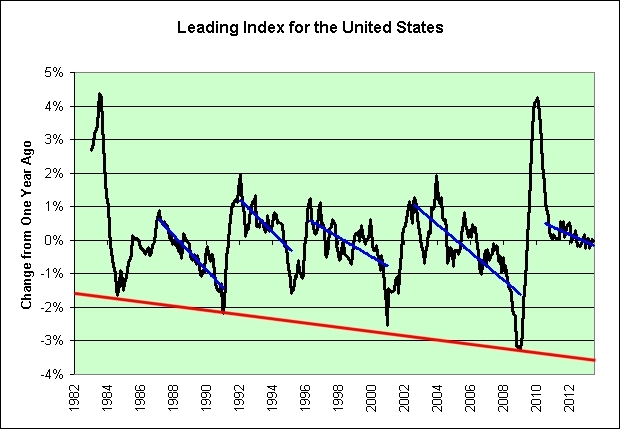 Gasp in horror at the return to the long-term declining trend lines. 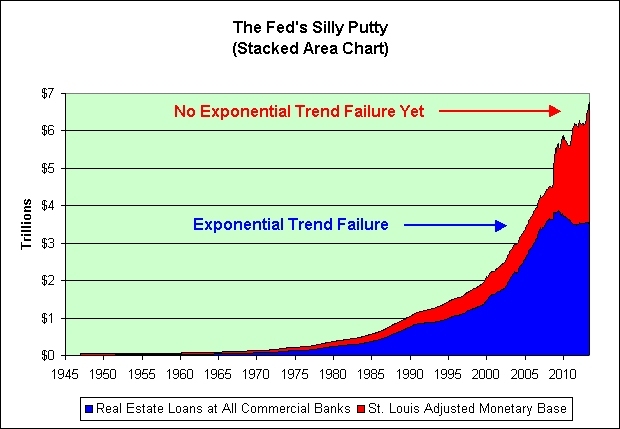 Behold the exponential trend failures which have been foretold for years! Any second now! Brace for them! 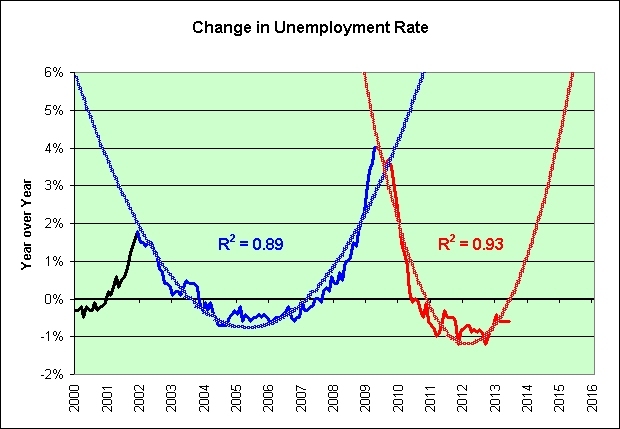 So when will the Fed raise rates? Let's listen to the experts! Only seven out of 25 participants are forecasting a rate hike in the next twelve months, and most of those expect it to come in the final three months of 2011. 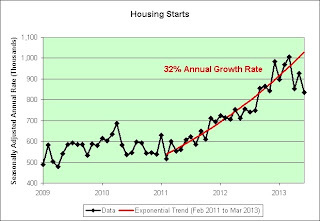 Another nine expect the next rate increase to come in the first quarter of 2012, while eight more are expecting a hike later that year. 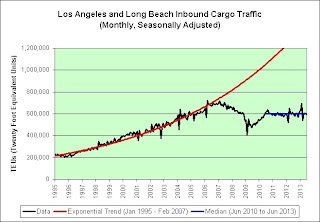 The current bid is 2012. Can I hear 2013? Yes! Broadly speaking, the consensus is that the Fed will do nothing on interest rates in 2012. 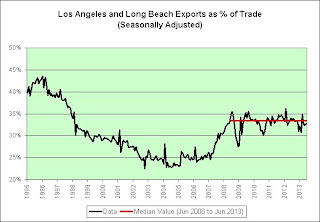 A few economists see it moving aggressively in 2013, but the majority don’t. 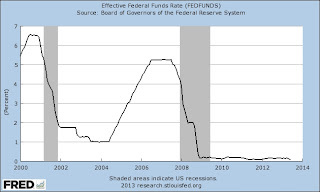 By 2014, though, the consensus sees an end to the long-period of ultra low interest rates engineered by the Fed in response to the financial crisis and slow recovery. Can I hear a "well before 2014"? Yes, you sir in your ivory tower! Can I get a 2015? Yes, you sir! 2016? Yes! Yes! This is a very popular item guaranteed to impress the ladies. Can I get a "Years in the Future" bid? Yes! 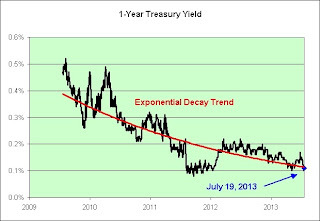 Seigel thinks that a 3% yield on the 10-year Treasury would take a bite out of the stock market. Sold to the desperate man in the ivory tower! Nicely played Professor Siegel! We'll just forget about your previous "well before 2014" bid. That was just crazy talk. 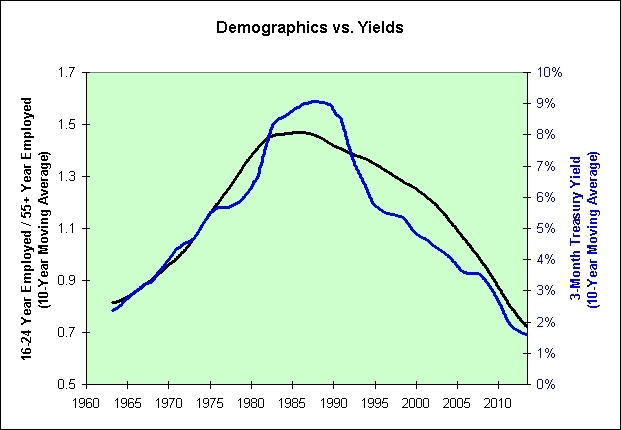 The following chart shows the difference in yield between the 10-year treasury and the average of the 5-year treasury and 20-year treasury yields. 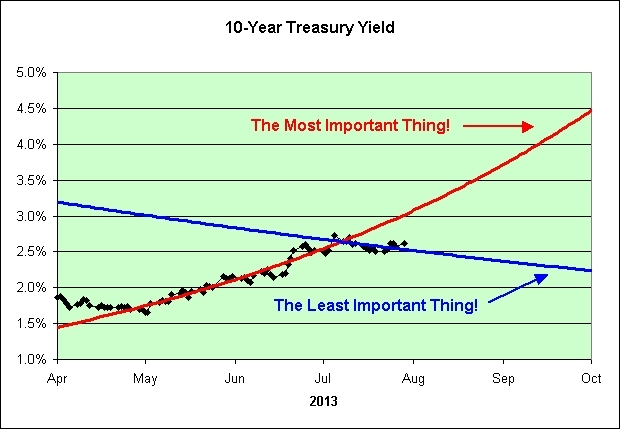 As seen in the chart, the 10-year treasury is actually yielding about 0.25% more than we might expect. By comparison to other treasuries, it is currently very unloved. 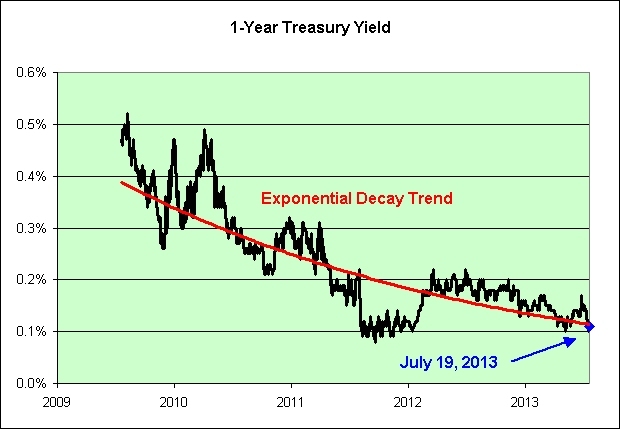 When was the last time we've heard a financial expert on CNBC tell us to buy a 10-year treasury and hold to maturity? 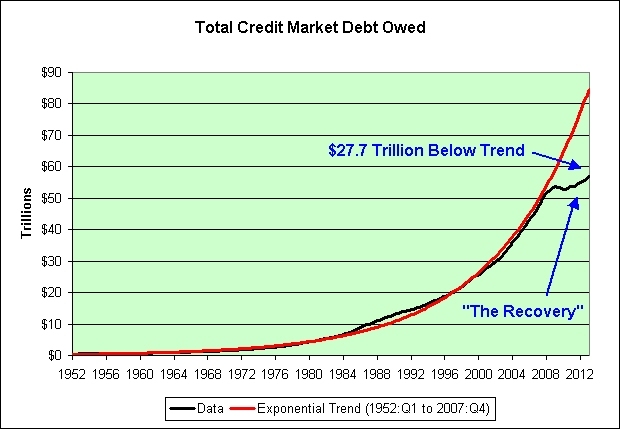 All we are told, ad nauseum, is how dangerous treasuries are. Right? 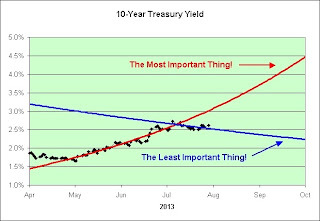 In my opinion, the financial "experts" keep scaring savers into shorter term treasuries because it is "common knowledge" that yields will rise any day now. Meanwhile, is there another group, a more secretive group, which apparently doesn't mind buying the 20-year treasury? 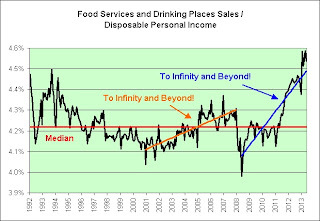 That's what I see when I look at this chart anyway. One group clearly embraces the 5-year. Another group clearly embraces the 20-year. It's very polarized. There is no middle ground. I very much doubt that both groups are right. On a risk vs. reward basis, perhaps the 10-year is a bargain. For what it is worth, I generally prefer long-term TIPS and I-Bonds, but I have also purchased long-term EE-Bonds in moderation (currently yielding 3.53% if held 20 years, since they are guaranteed to double in price over the period). 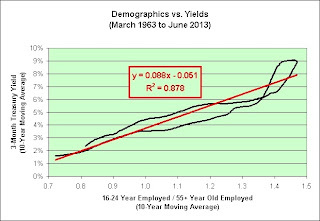 I continue to believe that this economy cannot support high real yields either now or well into the distant future. This is not investment advice. It's just something to think about. 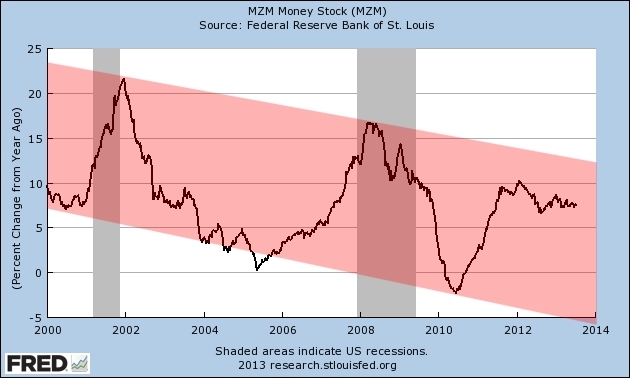 The declining trend channel in red shows the annual growth of the money with zero maturity (left scale). The declining trend channel in blue shows the interest rate on the three-month treasury bill (right scale). Here's the same chart with better scaling. Restaurants wrapped up another strong quarter of stock performance in the second quarter, with the average stock up 13%, compared to the S&P 500 gain of 2%. So far in 2013, restaurant stocks are now up 29% (vs. 13% for the S&P), led by smaller cap names. Every stock that the analysts at Deutsche Bank A.G. (NYSE: DB) cover is positive for the year. 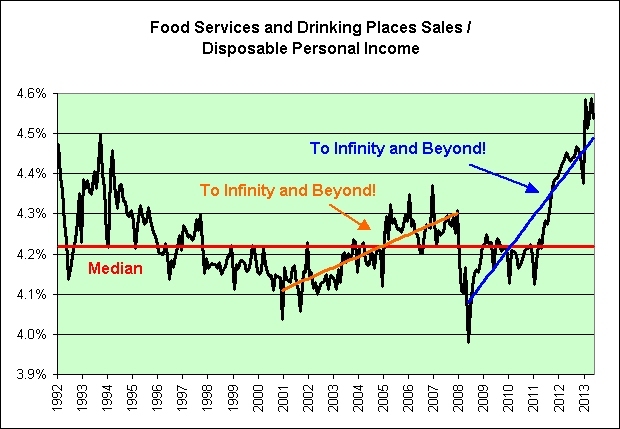 Gradual macro recovery, healthy cash flow and moderating food inflation continue to provide a solid underpinning for restaurant stocks. What could possibly go wrong again? 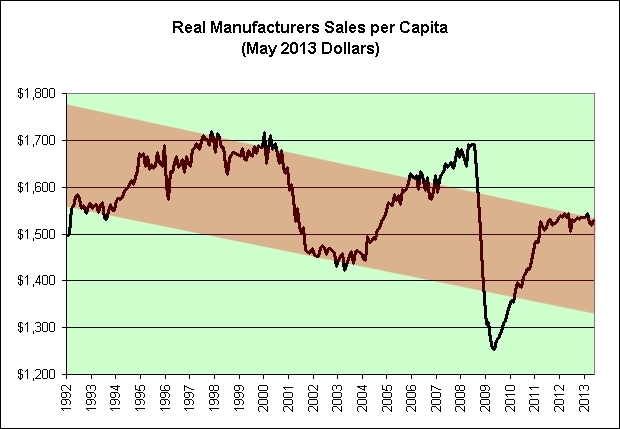 Conventional wisdom for a generation has been that manufacturing in America is dying. 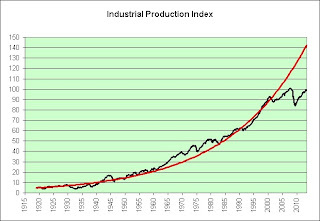 Yet over the past five years, the country has experienced something of an industrial renaissance. We may be far from replacing the 3 million industrial jobs lost in the recession, but the economy has added over 330,000 industrial jobs since 2010, with output growing at the fastest pace since the 1990s. 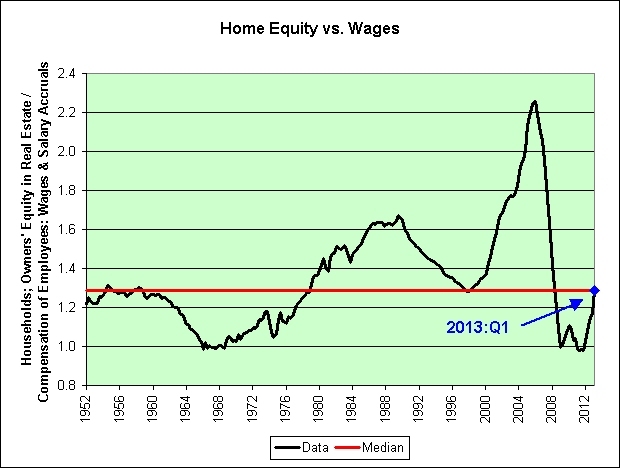 I doubt very much that we will make it to $1,700 per month (inflation adjusted) again. It's just a "conventional wisdom" opinion though. As a side note, what could possibly go wrong from here? It's not like we're at the very upper edge of a long-term declining trend channel. It's also not like we are stuck there as if unable to punch through. Oh, wait. Never mind. 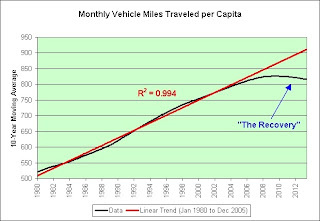 The velocity of money (also called velocity of circulation and, much earlier, currency) is the average frequency with which a unit of money is spent on new goods and services produced domestically in a specific period of time. 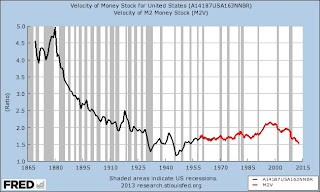 The line in black shows the historical velocity of money stock going back to 1869. 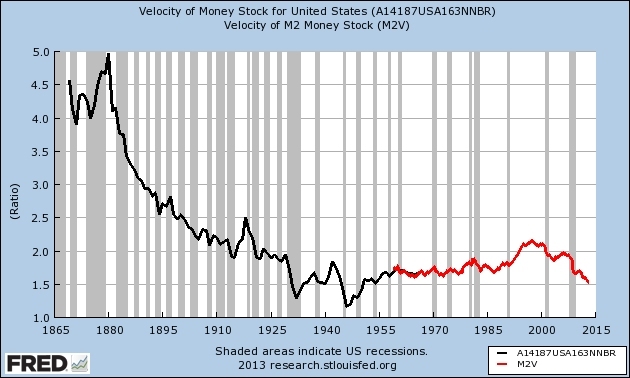 The line in red shows the velocity of the M2 money stock going back to 1959. 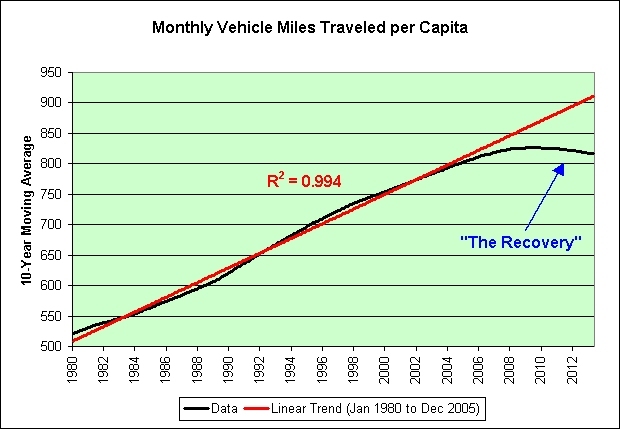 Note the downward trend since the late 1990s. What does this mean? 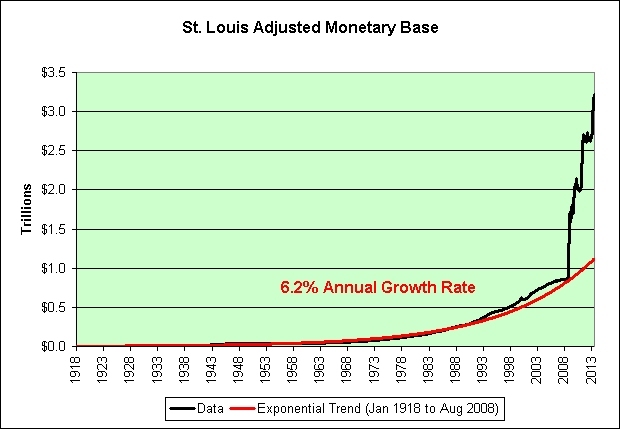 The "poning" of hyperinflation theories will continue until morale improves! It's just another panic pun day. 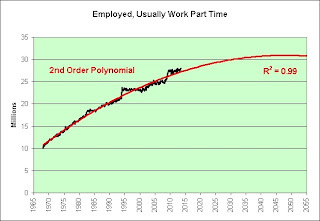 I'd be last person to argue that 2nd order polynomials can accurately predict our long-term employment future. On the other hand, I'd be the last person to think Ben Bernanke can either. The Market Ticker ®: The Problem With Ivory-Tower "Economists"
That's all right Ben. We may very well solve your conundrum in the decades ahead. Sigh. Samuel Taylor Coleridge: in 1816 the writer heard his death mentioned in a hotel by a man reading out a newspaper report of a coroner's inquest. He asked to see the paper, and was told that "it was very extraordinary that Coleridge the poet should have hanged himself just after the success of his play [Remorse]; but he was always a strange mad fellow". Coleridge replied: "Indeed, sir, it is a most extraordinary thing that he should have hanged himself, be the subject of an inquest, and yet that he should at this moment be speaking to you." We always hear about the bond vigilantes and how they are destined to arrive at any moment. However, as seen in the chart above, the certificate of deposit vigilantes are nowhere to be seen. Why do you suppose that is? 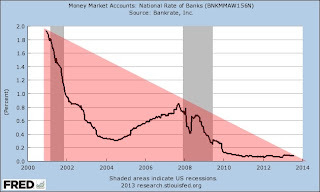 The following chart shows how much more the typical certificate of deposit "vigilante" could earn if they'd simply buy 5-year treasuries directly from the government instead of buying the typical 5-year CD from their local bank. As an added bonus, they wouldn't even need to worry about FDIC insurance. 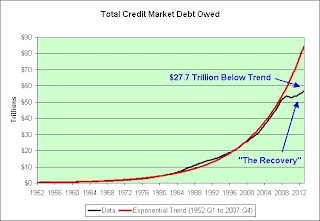 I participated in February 2011's treasury giveaway, much to the dismay of Jeremy Siegel. No complaints on that one so far. I also participated in June 2013's treasury giveaway (using interest from my purchase in 2011). No complaints on that one either. I bought intending to hold to maturity. That is still the plan. 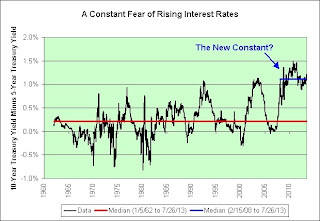 Meanwhile, investors panic out of bond funds and into cash the instant interest rates go up? I can't really explain it. I guess many don't enjoy earning more interest. Need proof? 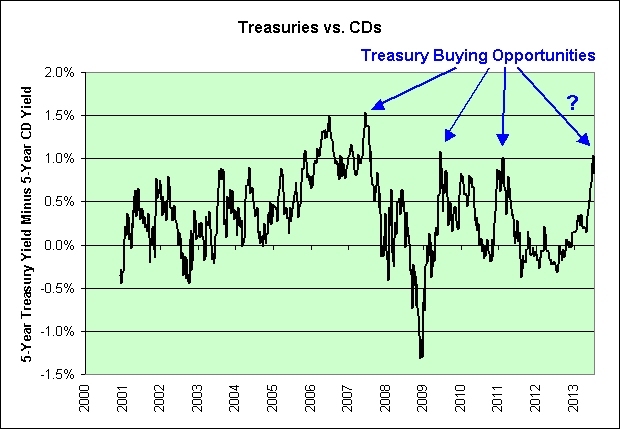 Can we not see the willingness of savers to accept a mere 0.5% rate on 5-year CDs? That said, I'm not at all advocating the purchase of a 5-year treasury. 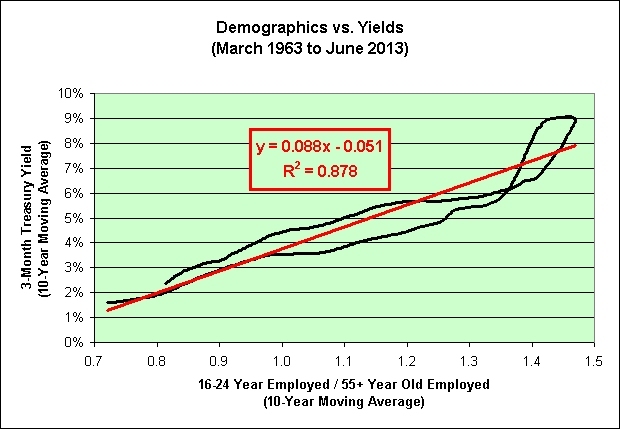 For what it is worth, I went out a heck of a lot further on that steep yield curve. 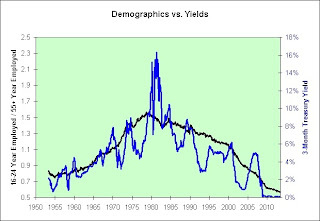 Unlike many, I do not believe that this economy can support high real yields either now or well into the distant future. 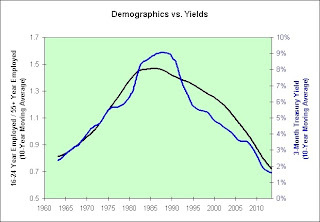 It has there for been my plan to lock real yields in whenever I could and I have been doing so since 2000 (the year I bought my first I-Bond). This is not investment advice. It's just the opinion of a random anonymous blogger on the Internet. Take it for what it is worth. Have no fear though! 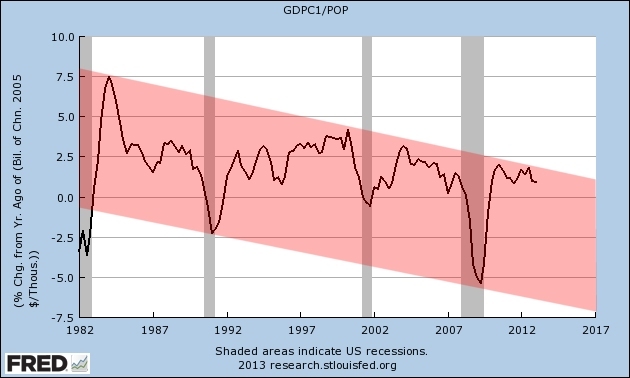 Ben Bernanke assures us that 2.9% to 3.6% real GDP growth is coming back in 2015. 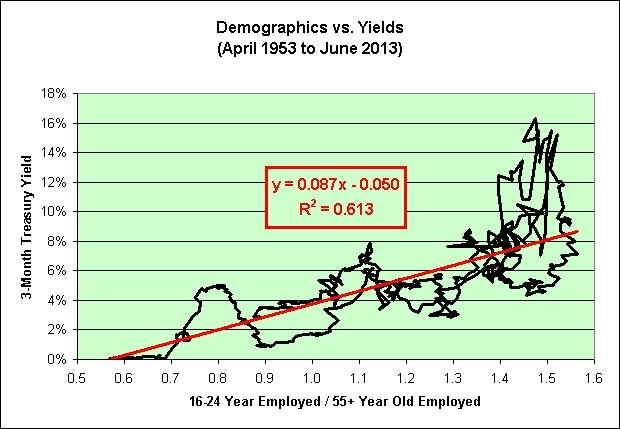 And let's not forget the 3.5% real yields that will no doubt come with it! Mark them on your calendar people! Good times ahead! 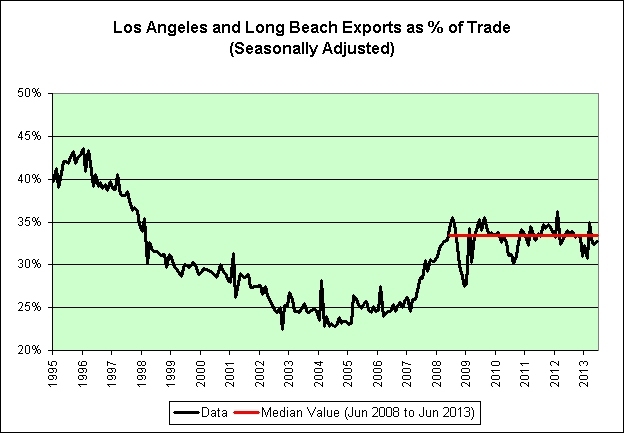 Just need to keep pushing this wreck of a derailed economic train right back on the tracks. What could possibly go wrong? This post is in response to every talking head on CNBC who tells me to keep a long-term perspective. Oh, yeah. I'm keeping a long-term perspective all right. Don't you worry about that, lol. Sigh. 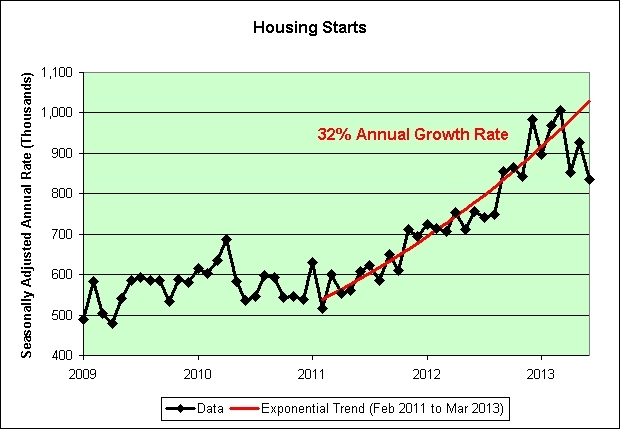 32% annual growth can't last forever. Right? As a side note, February of 2011 holds a special place in my heart. "All this means that Tips investors should beware. Although Tips may compensate holders for future inflation, the interest rate that they offer is far too low to offset the risk of rising rates." It's been 2 1/2 years since Jeremy Siegel warned us. 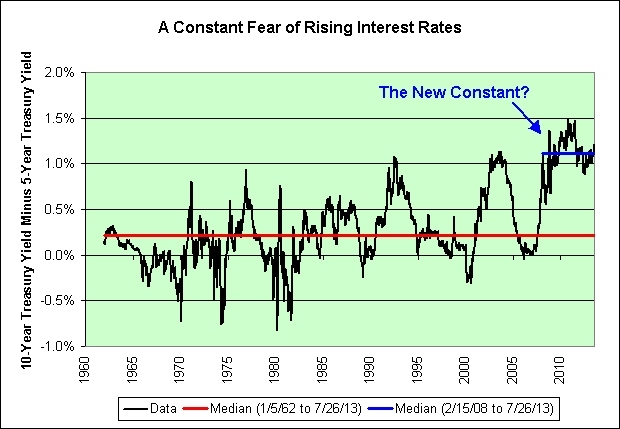 Behold the rising interest rate environment! It's just a simple answer to a simple question. I'm not saying that it will happen. I'm simply saying that it could happen. 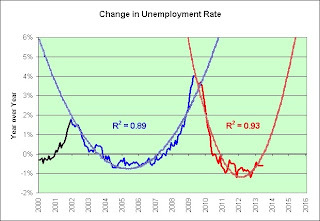 “If a substantial part of the reductions in measured unemployment were judged to reflect cyclical declines in labor force participation rather than gains in employment, the committee would be unlikely to view a decline in unemployment to 6.5 percent (unemployment rate) as a sufficient reason to raise its target for the federal funds rate. 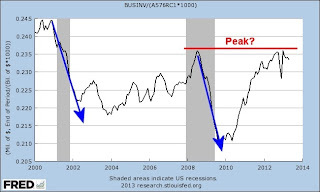 What if we don't even make it down to 6.5 percent before the next recession hits? As seen in the following link, Ben Bernanke's powers of assumption appear to exceed his powers of prediction (by a fairly wide margin). Welcome to the first "moderate dip" of the 21st century. 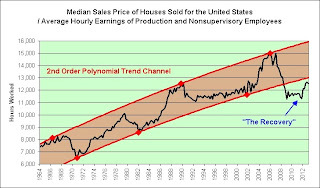 Thankfully, there was no housing bubble to go bust and therefore there were no monetary policy blunders leading into it, lol. Sigh. Sarcasm, it isn't just for breakfast any more. 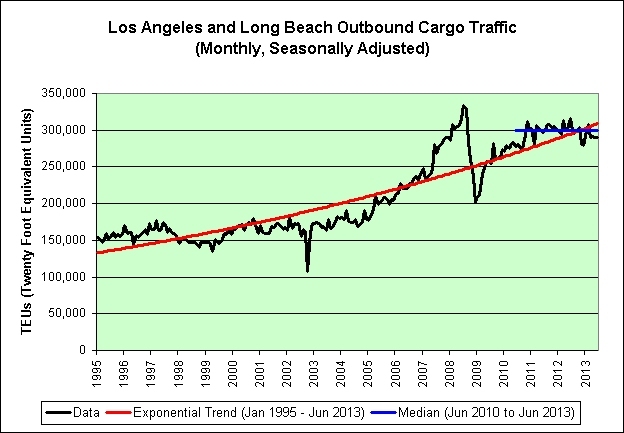 How are we doing relative to the long-term exponential trend? It could be worse I suppose. 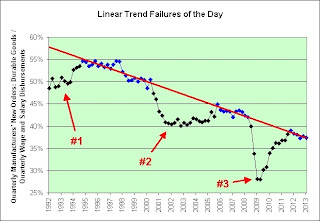 At least we're still in the declining trend channel.